Posted on November 2, 2018 November 2, 2018 Author SharonCategories Adverts, Blog, Liaden Universe® World Tour, Shameless Self-Promotion1 Comment on Reading and Book Signing Tonight! Book signing! Post cards! Publication Schedule! Conventions! Snuff! Today brings an infrequent professional post. 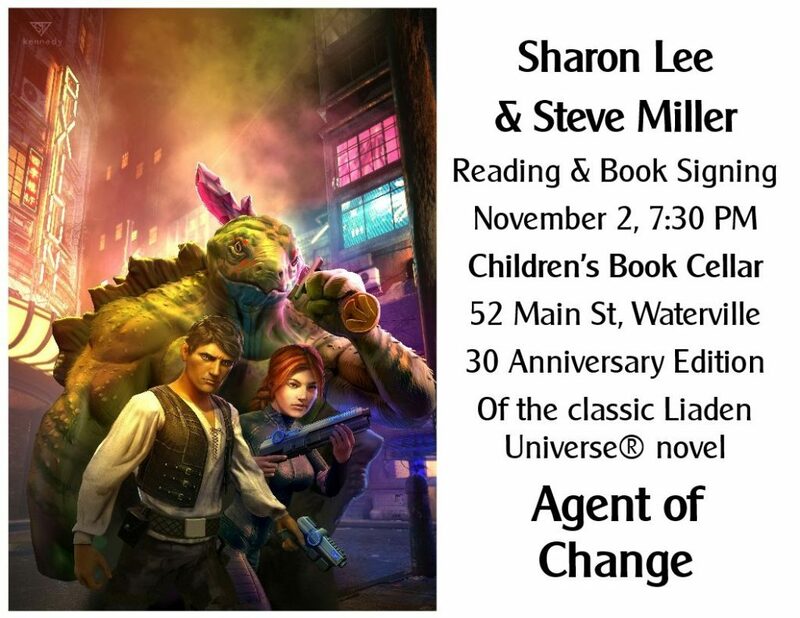 BOOK SIGNING: Sharon Lee and Steve Miller will be signing the anniversary edition of Agent of Change, and whatever else comes to hand, at Children’s Book Cellar, 52 Main Street, Waterville, Maine 04901, on! Friday, November 2, from 7:30-9 pm. Alert readers will note that this is also Fountain Pen Day. Coincidence? I think not! POST CARDS: If anyone is going to a convention, or is local to a bookstore that is amenable to taking promotional items (ask first, of course), or a reading group, or. . .and would like to distribute postcards and/or bookmarks for the new edition of Agent of Change, and for the Carousel books, please drop me a note at sharonleeATkorvalDOTcom, including your name and address, and how many postcards you would like. I will be delighted to mail them to you. “Command Decision,” a brand-new Liaden Universe® story, by Steve Miller and “The Vestals of Midnight,” a brand-new Archers Beach story, by Sharon Lee will be published in Release the Virgins, edited by Michael Ventrella, available in November. 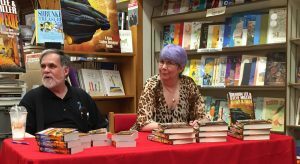 Accepting the Lance, by Sharon Lee and Steve Miller, the last book in the Five Book Dash, the twenty-second Liaden Universe® novel, is scheduled to be turned in to Baen in January 2019. Please note that this is a turn-in date. CONVENTIONS: As of this moment in time, Steve and I are planning to attend Boskone 56, February 17-19, 2019. A NIGHT IN THE LONESOME OCTOBER: Do you know where your copy of the classic Halloween countdown novel by Roger Zelazny is? Steve and I have ours, and we’re ready to start reading on September 30. Here ends the blog post. Posted on September 25, 2018 September 25, 2018 Author SharonCategories Blog, Liaden Universe® World Tour, Publishing, Writing1 Comment on Book signing! Post cards! Publication Schedule! Conventions! Snuff! . . .they were fleeing Maine with a nor’easter nipping at their heels. Since the Lakeshore Limited, aka Amtrak Train Number 49, leaves the Albany-Rensselaer train station at 7 pm, Steve and I decided to leave reasonably early (by which I mean, the sun was up by the time we were likewise), and take the Scenic Route. This, we did, stopping in Keene, New Hampshire, for lunch, and wending our way gently through the warm and sunny day. Shoppers in downtown Keene were wearing shorts and t-shirts, ignoring the predictions of Snowpocalypse for the morrow. We arrived at the train station in time to wait two hours before boarding, and having dinner onboard (Steve had the chicken; I tried to have the butternut squash ravioli, but they were out. Instead, they gave me (after due warning) mashed sweet potatoes formed with a melon ball and served under alfredo/spinach sauce. It was. . .interesting. ), returning to our room, and so to sleep. Breakfast next morning was a “scrambled egg bowl,” and then we arrived at Chicago Union Station with a nine-hour layover before us, which we shall pass over lightly. We boarded The City of New Orleans, aka Amtrak Train Number 59, at 8:30 pm, were served from the lunch menu (we each had a. . .muffaletta? ), and so to our room, and sleep. . .
. . .until 6:30 am, when the car attendant woke us so that we could de-train at Memphis, where we were picked up by Sylvia Cox in her hat as Guest Liaison for MidSouthCon. Sylvia was everything that was accommodating and good-natured, got us to an IHOP so we could grab breakfast, drove us up and down River Street, so we could observe the above-flood-stage Mississippi River at first hand, and so to the hotel, where there was no waiting to get into our room, despite it being Very Early in the Day. We repaired to our room and unpacked, then it was time to meet Jane and Pat in the lobby. Pat filled us in on the history of the Memphis neighborhoods Jane was driving us through, until we arrived at the Children’s Museum and! 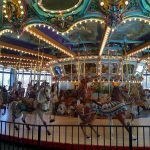 The restored 1909 Dentzel Carousel which was for many years the centerpiece of Libertyland Amusement Park. After we finished with the carousel, we invaded the Children’s Museum, which was just. . .awesome. So much interactive stuff — including an installation that taught you how to break into a safe; a real police car, and a FedEx jet. Things to climb on, things to climb through, an air current raceway for balls and scarves, the ever-popular Legos, a grocery store, a discussion of the US Mint and how money is made. . .
Yeah, we spent some time there. They ought to make these things adult-sized. We departed the Children’s Museum, reluctantly, and — because there were flowers blooming in Memphis and Maine was by that point buried under a foot of new snow — Jane and Pat took us to a Botanical Garden to admire the pansies, the tulips and the early daffodils, as well as some flowering trees. Eventually, we came back to rest at the Hilton, had lunch, a nap, and woke in time to get ready to share the pre-convention dinner of chicken spaghetti with con volunteers and those other Guests of Honor who had arrived. We had a lovely chat with Ellen Datlow, Editor Guest of Honor, and a changing roster of volunteers, as people broke for supper and then went back to the important business of putting the con together. Then, it was time for our first professional obligation: Signing on Pro Row. At 7 pm, it was time for Opening Ceremonies. Each of the Guests of Honor were escorted to their seats by Batman or Superman. I was escorted by Superman, while Batman did the pretty for Steve. Each of the Guests were introduced and given a gift box full of whimsical and useful goodies. Mike Resnick, the Toastmaster, told us a couple stories, we heard a little history of the convention, and it was official! MidSouthCon was On! Next morning, first thing, was the Teddy Bear Tea. Despite the early hour, it was well-attended by a variety of plushies, who socialized with each other while their human companions told the story of each one, and did some socializing of their own. Steve and I enjoyed ourselves, as did Lemmy, Jingles, and Hassan the Assassin. We then had the opportunity to talk to a ballroom full of attentive people about the history and times of the Liaden Universe®, attended the Baen Traveling Roadshow, and did a panel on characterization and social world building before it was time for the banquet and the presentation of the Darrell Awards. All the guests were brought to the front to be re-introduced to the convention, and asked to say a few words. After the banquet, it was the Epic Women in Epic Stories panel, ably moderated by Toni Weisskopf. Sunday morning, we hosted a breakfast in the restaurant for eight folks who had signed up to observe us before we were caffeinated. 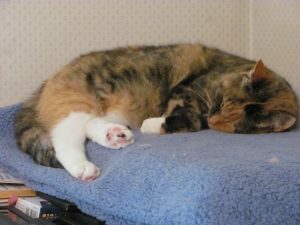 Topics ranged from cats, to writing, to the weather, to cats, and also — cats. After, we read Select Portions of Agent of Change — in celebration of the Thirtieth Anniversary — to a small but appreciative audience and! All too soon, it was Closing Ceremonies, and MidSouthCon was over for another year. Except for the Dead Dog Party, where barbecue was had by all. Because of how the trains run, we had most of Monday in Memphis. We used our time wisely, playing tourist, visiting the Peabody Hotel in time to do a thorough tour before taking up a position on the mezzanine to see the ducks march out of their lobby fountain, down the red carpet and into the elevator that whisked them away to their rooftop penthouse. After the ducks, it was a stroll down Beale Street, and a dinner, before moving on to the Memphis train station to wait for our ride. 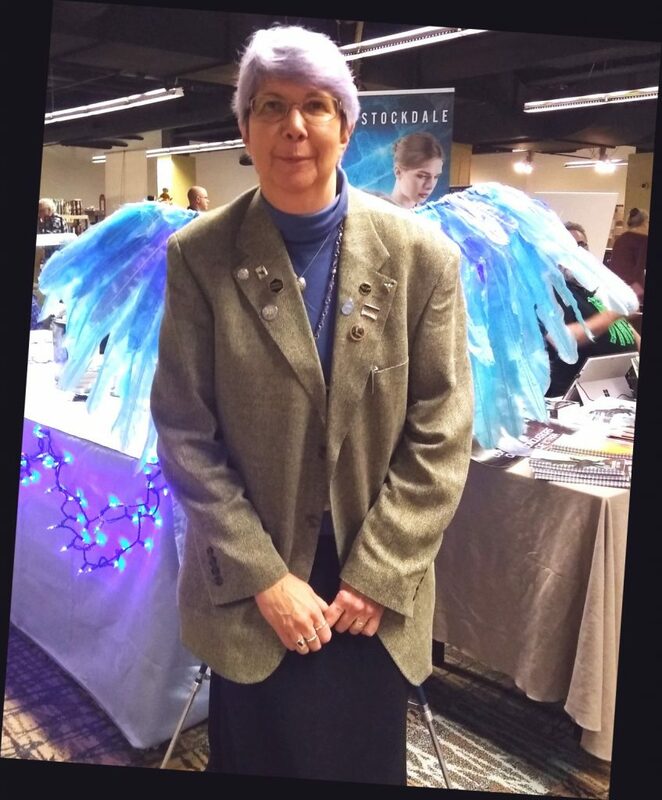 MidSouthCon was a terrific con — everyone we met was friendly and helpful, and sincerely glad that we had come to celebrate with them. Those of you who stayed with us this far will recall that, at the beginning of the story, we were fleeing a nor’easter. We returned home in the aftermath of a second nor’easter, which dumped eighteen-plus inches of snow on the head of most of New England. Happily, New England knows what to do about snow, and the roads had been plowed and cleared ahead of us. Our own plowguy had been in to shove snow out of the driveway, and clear the steps. Today, the snow is rolling off our new metal roof, and the plowguy came by with his front-loader to push the pile of plowed snow back, so he’ll have room to put the snow from the third March snowstorm, which is predicted for early next week. And that? Is all I’ve got at the moment. Glad to have gone; glad to be home. Speaking of bad news. . .
Again, we apologize, but — necessity is. Posted on July 26, 2016 July 26, 2016 Author SharonCategories Blog, Liaden Universe® World Tour4 Comments on Speaking of bad news. . .
. . .too many parts, in fact, running in all directions at once. Those who do not partake of the joys of Facebook may have missed the announcement that Sleeping with the Enemy, Adventures in the Liaden Universe® Number 22, is now on sale (as an ebook only) at Amazon, Kobo, ibooks, Page Foundry, and Tolino. We are told that it will be published RealSoonNow at BN/Noon, Scribd, and 24Symbols. As I write this, Alliance of Equals has garnered 86! reader reviews on Amazon. Only 114 short of 200! You guys are going gang-busters! . . .as we used to say. Steve and I have declared tomorrow an electron-free day, so we will be scarce-to-invisible. If you have an urgent matter to resolve, you can try emailing the cats, but, well — good luck with that. Today, at the Cat Farm. . .
. . .it was hot. 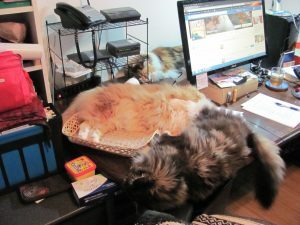 All four cats were in my office, because Ceiling Fan, but — it was still hot. More hot coming tomorrow. Yay, summer. For those coming in late, this chapbook will contain two stories: “Chimera,” which was published at Baen.com in May 2015 (I may have said April last night; we turned it in in April; it was published in May in support of Dragon in Exile, which was a June book. Ta-da! ), and “Friend of a Friend,” a brand-new story, also set on Surebleak. The book will include an author’s foreword. Distant early warning! We will be increasing the price of this chapbook, and all/any future chapbooks, from $2.99 to $3.99. Thank you for your understanding. I had hoped to get Sleeping. . . uploaded at least to Amazon tonight, but — it ain’t gonna happen. Possibly tomorrow night (more likely Sunday afternoon, though, because Book Signing tomorrow). In any case — soon. As of right now, Alliance of Equals has 61 reader reviews on Amazon. Only 139 more until we hit the goal of 200! As alluded to above, tomorrow, Steve and I will be signing book and talking trash at our local indie bookstore — Children’s Book Cellar, 52 Main Street, Waterville — at 2 pm. Drop by and see us if you can! And I think that’s all the news. Posted on July 15, 2016 July 15, 2016 Author SharonCategories Blog, Liaden Universe® World Tour, Publishing2 Comments on Today, at the Cat Farm. . .
Let’s do the bragging first, and get that out of the way. 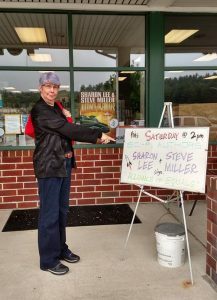 Last week, Alliance of Equals by Sharon Lee and Steve Miller hit Number 3 in the list of bestselling science fiction hardcovers, and! it was also Number 8 on the All Science Fiction list. Thank you all very much. This would not have happened without you! Steve and I have been working on putting together a new Echapbook. It is currently title-less, but will contain two novelettes, one old and one new. The “old” story is “Chimera,” which was published to Baen.com in March 2015. The “new” story is “Friend of a Friend.” Both stories take place on Surebleak. An author’s introduction will also be included. Speaking of Echapbooks! Over the next couple weeks, in my Abundant Spare Time(tm), I will be removing our Pinbeam Books chapbooks from the Smashwords store. There may be a Small Period of Readjustment as I set up distribution through Draft2Digital, but eventually the books will be back in the iStore, Kobo, and everywhere else. Amazon and BN listings will not be impacted. Amazon reader reviews for Alliance of Equals as of this writing number 48! Only 152 more needed to reach our goal of 200 reader reviews! Go, Team Liad! Also! For those who pre-order ‘waaaaaaaaaay out from Amazon — The Gathering Edge, to be published in May 2017, is now available for pre-order. We hope, but do not yet know (because, c’mon — eleven months out?) that the Uncle will once again conspire with us to offer signed and/or signed and personalized copies for pre-order sometime much closer to the publication date. And, remember! Steve and I will be talking books and signing them, too, at the Children’s Book Cellar, 52 Main Street, Waterville, this Saturday, July 16, at 2 pm. Hope to see you all there! I was editing today, and I want to assure you that I had Expert assistance. An’ if he wasn’t the sharpest knife in the drawer, he’d do ’til something lethal came along. Today’s blog title brought to you by Pete Seeger by way of Bruce Springsteen, “Erie Canal.” Here’s your link. Today is Tuesday, which means! Tomorrow is Wednesday. I need to do the hospital thingy tomorrow. Best not to lose track of that. Trooper — remind me tomorrow that it’s Wednesday, and I need to be away from the house for five or six hours. So, let’s see. . .
As of this typing, there are 36! reader reviews on Amazon for Alliance of Equals, which is pretty impressive. Only 164 more until we crack 200! 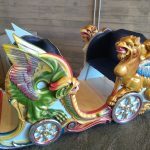 Though the micro-mini book tour was in support of Alliance of Equals, we/I were asked several times about the possibility of another (or, as one interlocutor had it, “the next”) Carousel book. At this point, the Carousel books are a trilogy. Really. There are a number of reasons for this, including lack of Author Time, and Failure to Become a Bestseller. I wrote Carousel Tides (against Best Advice) while we were between contracts, ‘way the heck back in 2006. It was rejected By Nearly Everyone (foretold by Best Advice) through 2006 and 2007, purchased by Baen in 2008, saw print in 2010, and! began earning royalties in 2014. Not only can I not go to Vegas on that, but — more importantly — I can’t put cat food in the bowls. Now, I’m fortunate (and grateful) that Baen kept Carousel Tides in print long enough for it to start earning. Too many of my colleagues see the hard copy editions of their work yanked after two or three accounting periods for “lack of numbers,” and never have the opportunity to earn out. 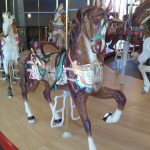 But, the fact remains that the Liaden books earn many, many times more than the Carousel books. Make no mistake — Clan Korval keeps the cats fed and the electricity on. Mind you, this has nothing to do with whether I’m “tired of” the Carousel premise/characters, or have run out of ideas. Just between you and me, I’ll probably be writing some more stories in the Carousel/Archers Beach/Six Worlds universe, because that’s how I roll. But the likelihood of another novel anytime soon — or, really, at all — isn’t high. I do know that Kate and Company have some very devoted fans — thank you. But — we have as of this writing four* Liaden novels still under contract, and contracted work — which is to say, the work that pays the bills — must come first. 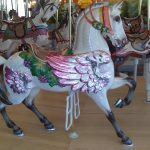 In addition, you may find the Carousel Trilogy in paper and ebook at all of the Usual Suspects. *Stares at delivery schedule on the wall. Right. Four novels; not five.